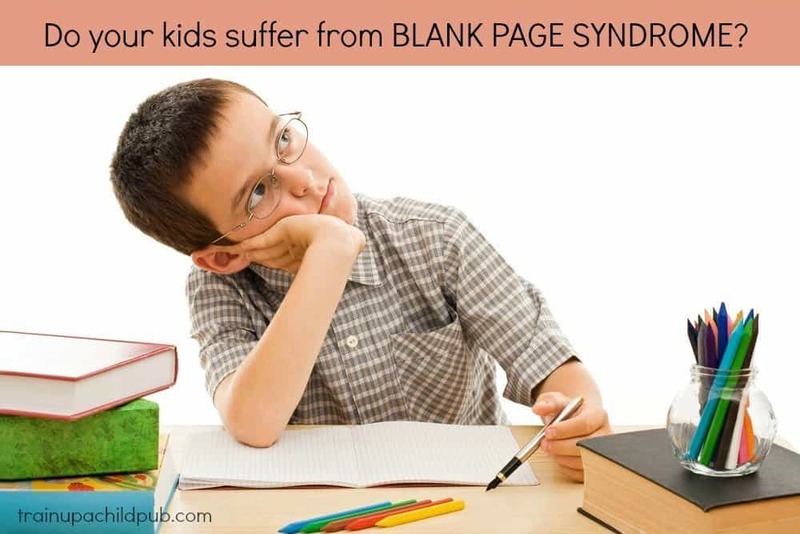 Do your kids struggle with Blank Page Syndrome? Steam is starting to come out of your ears listening to the tap, tap, tap of his pencil on that blank page as he sits there… groaning and sighing, staring at the ceiling fan going around… and around…and around. When is he going to get started with that writing?! I know what that’s like. I had one, too. Not just had one. Heck, I AM one. Staring at a blank page is totally intimidating. So here is one idea you can implement TODAY that will help YOUR reluctant writer practice writing relatively painlessly. This is simple but effective. All you do is have your student begin a reader’s response journal and write in it every day. But only for FIVE MINUTES. Tell your writer that even if he has more to say, he can only write for five minutes. How to make the blank page less intimidating. So here’s how to do it. Find a smaller sized spiral notebook or a composition book. (Smaller = less intimidating.) Your student is going to use this for a short daily writing assignment in response to a short prompt. Writing about an exciting story is easiest. How this daily assignment can help build writing fluency. If your goal is to build writing fluency, I recommend you focus on just having him write without editing his writing. (If you have a particularly interesting response from your student on one day, you can always choose to make that into a writing project for the next day or for that week. One tip: Make sure the writing is done immediately after the reading. Not only does daily writing increase writing fluency, this assignment also helps your student develop the ability to choose the main idea and to summarize a passage, both important writing and critical thinking skills. Start with easier response prompts and then move to more advanced prompts as your student gets used to the process. Remember that around middle school students mature to the point where they begin to be able to think more analytically, but this is a developmental thing. If you are not sure your student is ready but you have been doing this awhile now and you want to ratchet it up a bit, occasionally pitch your student a more analytical question and see how it goes. For your more artistic students, feel free to throw in some prompts that require illustrations. You can always have him go back and write further about the illustration the next day. Here’s a month of writing prompts to get you started. Do you like what you are reading? Why or why not? In a few sentences summarize what you read today. If you were a character in this book, who would you be and why? Is what you are reading believable? Why or why not? Draw four objects that represent your reading. Write a sentence for each item and tell how it relates to your reading. Write down one word from your reading today that you didn’t know. What do you think it could mean? Explain what made you think that. Is the setting (where and/or when the story takes place) described well enough that you have a ‘picture’ of it in your mind? Why or why not? Draw the setting in which the story takes place. Describe your favorite character and explain why. Describe your least favorite character and explain why. If you were writing this story, what would happen next? Tell me about the main character. What kind of person is he or she? Tell me what problem the main character is facing. What would you do to solve the problem? Describe what has happened in the story so far? What is your favorite part of the story so far? Write about your least favorite part of the story so far. Have you found anything boring about your reading? What made it boring? If you were writing the story, how would you make it more interesting? Describe the thoughts and feelings you had while you were reading today. What are the two most important ideas from this story so far? Tell me the title of this book. Do you think the title fits the story? Why or why not? What have you learned from this story? What ideas do you have about what will happen next? Has the author given you any clues in the story? What were they? Describe an object that’s important to the story. Draw it. Why is it important? Describe what one character from the story looks like. What is the most important event that has occurred in the story so far? Who do you think is the most important character in the story and why? What have you learned about life from reading this story? Write a paragraph about the main character in the story. Write a paragraph telling about the setting of the story. Has anything happened in the story that was unexpected or surprised you? Why? Write about what one character feels. Write about when you felt that way, too. Wind it up quickly, but be consistent. Hang in there, Mom! You are might hear some groaning about this, but if you cut down on other writing for the first week to compensate for this daily assignment, it will go better. Having a prompt to respond to and keeping it to five minutes will make that blank page much less intimidating! And yes, you can extend the time in small increments after the first week or so… but I would keep it fairly short, perhaps 10-15 minutes. Have you tried reading response journals before? How did it go? I’d love to hear about your experiences in the comments! Hello there, Christie; I’m happy the idea was helpful! I would start with just the literature book, as that format lends itself best to this type of writing. Continually writing about one book at a time will help your son learn to look at it more deeply, helpful for critical thinking. Historical fiction would be another excellent choice for a book to respond to. I would continue the oral/written narrations on non-fiction history and science books. Let me know how it goes! Thank you for an excellent idea. I plan to implement this with my 11 year old son in the coming weeks. He’s writing some narrations, but I think the consistency of writing in a reader response journal daily will help his writing improve a good bit. Do you recommend doing this with only one book per day? He reads from history or science and literature daily. Just wondering if I should alternate books or stick with one. Thank you! Journal or response writing often proves to be a successful tool for reluctant writers. Consistent evaluation and commenting on your child’s writing will encourage him or her to write more. Allowing your child to choose from the topics helps provide a sense of “control” over a subject that you child may not love.